1. Preheat oven to 180°C. Whisk rye whiskey, honey, molasses, red pepper flakes, and black pepper in a medium bowl. 2. Set ham on a rack in a large roasting pan and pour in 2 cups water. Score fat in a crosshatch pattern, cutting about ½ cm deep. 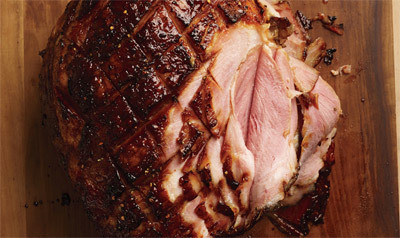 Brush ham with rye whiskey mixture and roast, basting every 20 minutes with pan juices and tenting with foil if browning too quickly, 1½–2 hours.